Elliminyt Methodist Honour Roll, presented by I. Hebb, commemorates those from the church who served in World War One. The anniversary public meeting of the above church took place on Monday night; there being a large attendance and much interest evinced in the proceedings. The chair was occupied by the Rev. Wesley Johns. 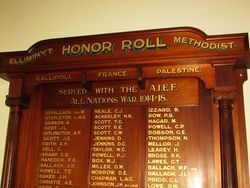 The second part of the programme comprised an unveiling of the Honor Roll, which was performed by Mr Walter Selwood, who expressed the pleasure he felt by being invited to take part in the ceremony that night. Mr Selwood read over the names of the thirty-four men who had been recorded since the first unveiling in October, 1915. The total number now on the roll is sixty-five. 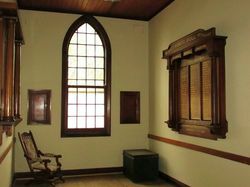 In addition, twenty-three other young men enlisted, but were not accepted for service abroad, making the total enlistments of those at one time associated with the Church or Sunday School, eighty-eight. The Colac Herald (Vic), 26 June 1918. ALL NATIONS WAR 1914 - 18. 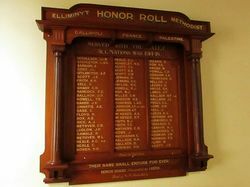 "THEIR NAME SHALL ENDURE FOREVER"
HONOR BOARD Presented by I.HEBB.